I was always active growing up but it wasn�t until my early 20�s that I discovered running. I started out as many beginning runners do, logging 1-2 miles at a time, increasing the miles over the years until I was eventually running 50-70 miles a week. Running became my constitution. As a twenty-something, my days were filled with working, running, sleeping and eating. I ran the local Chicago racing circuit, then marathons. I was happy and I felt terrific. In my 30�s, as I married, held a full-time job and raised two kids, I continued running and, after all the swimming I did during my pregnancies, I started competing in triathlons too � still happy, still terrific. But then after 25 years of competitive running and a dozen triathlons � not so terrific. The cartilage in my left knee was damaged. Agonizing pain, limping, swelling, and waking during the night from pain became typical. I depended on ibuprofen to get through each day. I was miserable, continuously in pain and unable to run�or be active at all. Even gardening became too painful. From appointments with foot doctors, diagnostic x-rays, purchasing better running shoes, MRIs, orthopaedic surgeons, arthroscopic debridement, Pilates, microfracture procedures, injections, prescription pain killers, and physical therapy, I was desperately seeking a solution that would enable me to get back to running. Feeling frustrated that nothing helped, I was determined to run again. Finally, in early 2008 I was referred to Dr. Brian Cole. Dr. Cole gave me hope that I could regain my mobility with surgery. In November 2008, Doctor Cole�s team performed an osteochondral allograft transplant (OAT) on my left knee. The surgery was immediately followed by 8 hours/day of continuous passive motion (CPM) and a full year of serious rehab. I learned to walk again after 12 weeks of no weight bearing. I swam laps when I couldn�t put weight on my knee and lifted weights while sitting. I discovered creative ways to keep active during the long year of rehab. 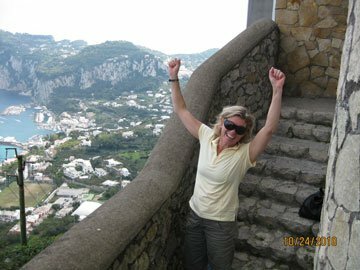 In October 2010, two years after the surgery, my husband and I travelled to Italy�s rugged Amalfi Coast. This trip would definitely test my new knee. On a day trip to the Isle of Capri, we decided to hike the Phoenician trail � an ancient walkway climbing over 1,000 feet to the island�s summit. At the top, as we looked out over the deep blue Tyrrhenian Sea, I knew my knee had passed the test. It�s been 2.5 years since my surgery and I am a completely pain free. I exercise vigorously every single day, swim with a strong kick, bike for hours at a time, hike miles up steep hills, and I even run an occasional 3.7 miles. Before surgery this never seemed possible.